George Clooney is a graying but still gorgeous movie star known for playing somewhat scruffy rogues, usually with hearts of gold. Clooney played in two different TV hospital shows, E/R, a 1984 half-hour sitcom starring Elliott Gould, and ten years later ER, the hour-long medical melodrama. On the big screen, his leading roles include Three Kings, The Perfect Storm, and Ocean's Eleven. Clooney has feuded with paparazzi, and for years wouldn't speak to Entertainment Tonight after that show ran clandestinely-filmed footage of Clooney. He was named People Magazine's Sexiest Man Alive in 1997, but became the first to "abdicate" the honor, in protest over their style of celebrity journalism. "You know who I'm dating right now?," he once asked rhetorically. "Apparently Mark Wahlberg. It was in some paper." 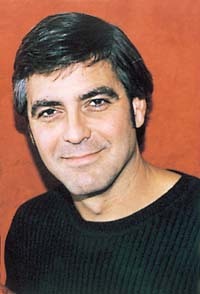 Clooney was again named People's Sexiest Man Alive in 2006. Publicly feuded with Bill O'Reilly over Clooney's participation in two telethons -- the 2001 fundraiser for 9/11 relief, and a 2004 fundraiser for Indian Ocean tsunami victims.